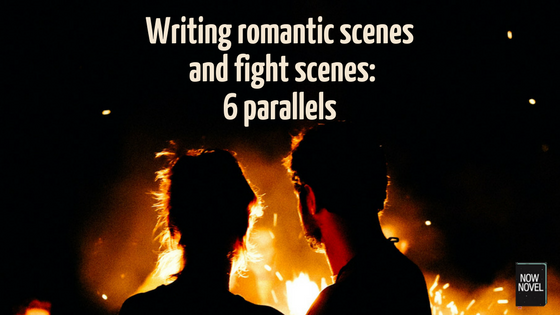 There are four things great scenes of all types (not only romance and conflict scenes) require. Firstly, strong scenes have structure; shape. We sense when things are building to the mid-point or drawing to a close. We discover what place and scenario the scene is concerned with and things play out from there. Secondly, great scenes have purpose. Besides entertaining us, they illustrate an important detail of plot (for example the reason for the main character’s sour or sunny disposition). Thirdly, great scenes have clarity. A fight scene is impossible to follow when you can’t tell who is insulting or attacking whom. Finally, the best story scenes have clear direction. We can sense where they are headed due to characters’ behaviour and thoughts, due to scene setting (and changes in setting) and other signs of progress towards characters’ goals. (You can read concise information on writing great scenes, including examples of effective scene opening and development, when you download our free guide to scene structure). In a steamy romance scene, the setting is typically somewhere private, where characters who are lovers (or not yet lovers) can get intimate. For example, special FBI agents become more than colleagues when they have to share a hotel room. Adventuring fantasy duos kindle more than a fire when they need to keep warm overnight in a cave. Similarly, in the best fight scenes, the setting actively contributes to the encounter possibilities of the scene. In an abandoned warehouse law enforcement might have a hard time finding their way around. This creates time and space for a major scene of conflict to play out. Settings in romantic scenes and fight scenes alike force characters to face the inevitable, be it a kiss or a sword fight. An example: The train to Hogwarts in J.K. Rowling’s Harry Potter and the Prisoner of Azkaban (1999) is an excellent setting for a confrontation between Harry and one of the chilling wraith-like creatures sent to guard the school against alleged murderer Sirius Black. Given these creatures’ stationing at the school, it is inevitable there will be an encounter between them and Harry. Yet the train to school stops between stations, and the usually safe space transforms into the stage for an eerie, unsettling encounter, as the Dementors board in search of Sirius. The fact that one almost attacks Harry foreshadows further conflicts between students and Dementors. It also creates a sense, from the outset, that no setting or space in the novel is safe from attack, contributing to the novel’s darker, more menacing tone. The example above is a good reminder that a setting can be either the probable or improbable location for a fight (or romantic encounter). Ghoulish creatures might attack on the shores of a dark, deserted lake at nightfall. Yet when they do in a daytime setting assumed secure, the effect is often stark. There’s good contrast. Similarly, two lovers might grow more intimate and kiss in a secluded, private space, but romance can also strike by surprise in unlikely places. Whether your setting is typical for a fight or romantic scene or not, think about what it contributes to your scene. For example, in the Harry Potter example above, because the near-attack occurs on a train in the middle of nowhere, Harry can’t simply leap off and dash to safety. This sense of confinement ups the tension. Setting in fight and romantic scenes alike should foster the conditions for unavoidable contact. Character psychology: The frame of mind of your focal or narrating characters shapes mood too. For example, a highly strung, anxious potential lover might make a usually-romantic setting appear dangerous, full of opportunities for embarrassment and awkwardness. Maybe there are stairs to fall down, vases to knock over. Mood should be relevant to the primary events of a scene. If the mood of your scene is dull and passionless, it could seem odd if characters suddenly start tearing each other’s clothes off. Think of small, significant details that build a romantic (or, in a fight scene, combative) mood. Well-crafted mood adds to tenderness or animosity, filling out your scene with the detail that makes characters’ actions seem even more inevitable. A romantic scene and a fight scene have something further in common: Both trade in raw emotion. Characters’ desires and goals and how they align or compete lead to romance or conflict. Both paths are full of possible tension. In a romantic scene, you can express tension between characters verbally and/or physically. Characters’ conversation, for example, might be overly polite, with the strained silence around what’s said speaking volumes. This sort of strained conversation is effective for suggesting that there is something being held back (a confession of desire or love, or anger). It’s a subtle form of tension that often features in period novels (as in the example below) that explore the difficulties of courtship. Miss Vincy was alone, and blushed so deeply when Lydgate came in that he felt a corresponding embarrassment, and instead of any playfulness, he began at once to speak of his reason for calling, and to beg her, almost formally, to deliver the message to her father. Rosamond who at the first moment felt as if her happiness were returning, was keenly hurt by Lydgate’s manner; her blush had departed, and she assented coldly, without adding an unnecessary word, some trivial chain-work which she had in her hands enabling her to avoid looking at Lydgate higher than his chin. The tension of desire and expectation, and the awkwardness of romantic feelings held back, together create a sense of suspense. Both characters appear to avoid direct connection. The factors contributing to tension and eventual contact in a fight scene are similar to those of a romantic scene. Physical proximity between hero and villain (or two warring lovers) is naturally necessary for things to escalate. Dialogue is also important, too. It is through dialogue that one opponent might taunt or insult the other enough to prompt an exchange of blows. They were moving parallel to the cliffs now, and the trees were behind them, mostly. The man in black was slowly being forced toward a group of large boulders, for Inigo was anxious to see how well he moved when quarters were close, when you could not thrust or parry with total freedom. He continued to force, and then the boulders were surrounding them. Inigo suddenly threw his body against a nearby rock, rebounded off it with stunning force, lunging with incredible speed. Throughout the conflict, the characters’ proximity increases until they’re surrounded by boulders. Goldman also increases the scene’s tension succinctly with the words ‘first blood was his’, because the words imply it is the first injury of more to come. “You are most excellent,” he said. His rear foot was at the cliff edge. He could retreat no more. “You are better than I am,” Inigo admitted. “And what is that?” asked the man in black. “I’m not left-handed,” Inigo replied, and with those words, he all but threw the six-fingered sword into his right hand, and the tide of battle turned. Goldman builds tension to a climax with physical sparring and description, then uses dialogue for a dramatic reversal. A similar effect could be achieved in a romance scene by making two characters get closer physically until one speaks, admitting desire (or, for a complication, a devastating bombshell). After all the tension building, the groundwork preparing a fight or embrace, the scene comes to a head. Some scenes may instead use anti-climax (also called bathos) to reduce tension or defer a dramatic encounter to a later stage (effectively sustaining primary unresolved tensions longer). For example, characters burst into the fifth floor room where they think a villain is hiding, only to see a small, open window with a makeshift rope hanging down the side of the building (indicating a getaway). Up the stakes: In the sword fight above, the man in black gets Inigo to a precarious position, upping the need for clever thinking on Inigo’s part. Every conflict and every romantic entanglement has an aftermath of some kind. In a romance, for example, the co-workers who hook up after a wild work celebration still have to file into a team meeting straight-faced on Monday. While we usually mean ‘aftermath’ in the sense of fallout, of negative results, a key conflict or romantic encounter may also be a positive turning point for your characters. How does this scene prepare or foreshadow what comes next? Do you need constructive input on a scene of romance or contact? Join Now Novel and get helpful feedback from an online writing group or personal writing coach.